Don't Lose Your Mind, Lose Your Weight is a life-changing book that can help you get the perfect body you always crave for. Famous Bollywood personalities like Kareena Kapoor, Karishma Kapoor, Saif Ali Khan and Preity Zinta have been able to stay in shape by following the advice dished out by the celebrity fitness expert Rujuta Diwekar. The author highlights that you can eat just about anything that you would like to eat, as long as you make sure to plan it. Her methods are devoid of crash-dieting, unnecessary food-cravings, carb-starvation and other similar nuisances. She guides you through simple steps into what she believes is the ideal way to diet. She helps you understand what your body is like, after which you can create an ideal plan that suits your body. This can be done by a simple modification of your eating habits. The author shows you how Kareena Kapoor was able to get the perfect bikini-body that she needed for her role in the hit Bollywood movie, Tashan. Rujuta shows you how you can indulge with your favorite food yet shed the unwanted calories. She believes that the same tricks that helped Bollywood's biggest names will certainly be of a great help to you too. Don't Lose Your Mind, Lose Your Weight has been published by RHI in the year 2009 and is available in paperback. Key Features: The author offers you the tried-and-tested ways to lose weight. She guides you as to how you can understand your own body, after which you can determine a suitable diet plan. 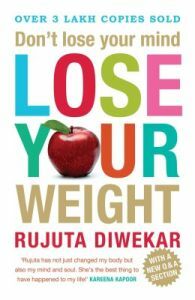 The author of Don't Lose Your Mind, Lose Your Weight, Rujuta Diwekar, won the Nutrition Award in the year 2010. She won this sought-after award from the Asian Institute of Gastroenterology. She received instant success with her first book, selling more than two lack books in four different languages. She is also the only nutritionist who received accreditation from the Sports Dieticians, which is based in Australia.